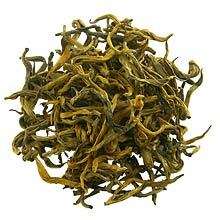 Yunnan Pure Gold is Yunnan province's first ever Black tea. It was created in 1938 using high quality tea leaves from Fengqing county. This tea was originally to be named Yunhong following common practice of naming Black teas in China - where Qimen county (Anhui province) has "Qihong", and Yichang county (Hubei province) has "Yihong". However, Yunnan Tea Company later changed it to Dianhong (the Chinese name of Yunnan Pure Gold). "Dian" is the short name of Yunnan. Exceptionally smooth and delicate tea, with hint of malty taste. Blends well with sweetened milk for added flavor. The leaves are purely golden in color and the infusion is amberish/yellow color.